It was another successful week for Bowie powerlifting teams as both boys and girls won their respective meets. The Jackrabbit team hosted a league meet on Feb. 7 against four other schools from the same region and division. Thanks to 10 lifters placing in the top three of their weight classes, including three gold medals, Bowie outpointed Alvord by seven points to win the overall team title. Top finishers included Dalton Davis winning the 148 pound division with a 1,035 pound total, Zack Otto winning the 220 pound division with a 1,290 total and Bryan Arellano winning the 242 pound division with a 1,260 total. 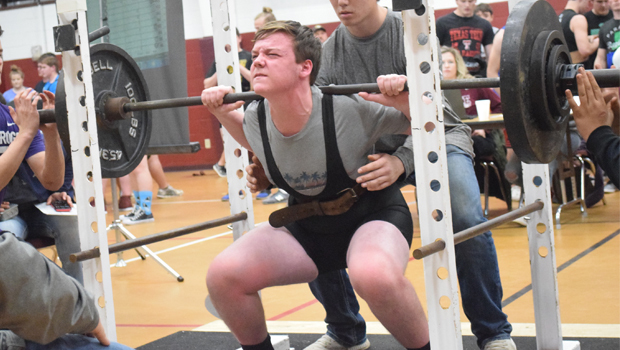 Other lifters who placed included: Raiden Brezina earning second in the 114 division, Roman Rivas and Ethan Meyers earning second and third in the 132 division, Joey Crawford earning second in the 165 division, Jacob Skinner and Victor Tran placing second and third in the 181 division, Tyson Herron earning third in the super heavy weight division. Based on totals, Skinner and Tran have the second and third highest totals in the region in the 181 pound class. Rivas and Otto also are both listed third in the region in their weight classes according to their highest totals. The girls traveled to Perrin-Whitt on Feb. 9 to compete against 10 other schools, including some from division one and two. Despite the competition, the Lady Rabbits dominated as they won the overall meet by more than 20 points as 11 lifters contributed point totals, including six gold medals. Top finishers include: Jessie Henry winning the 97 pound weight class, Sierra Skinner winning the 104 pound weight class, Emma Skinner winning the 114 pound weight class; Kerstin Kindsfather winning the 148 pound weight class, Carrington Davis winning the 198 pound weight class and Chelsea Price winning the 220 pound weight class. Other lifters who contributed to the point total included Jenna Rogers earning second in the 148 division, Ashley Aguirre earning third in the 123 division, Maddie Baker earning third in the 132 division, Harley Lowe earning fourth in the 220 division and Breanne Masingale earning fifth in the 148 division. Emma Skinner and Davis each won lifter of the meet, Skinner among the light weight classes and Davis among the heavy weight classes. Both of them set PRs with their total weight as Skinner’s 640 was a 70 pound jump. Davis broke the 1,000 pound total for the first time, a feat Coach Quentin Berend said he has never seen a girl he has coached do before. Davis and Henry both have the highest weight total in their weight classes in the region. Davis has the distinction of having the highest weight total in both the 181 and 198 weight classes. Sierra and Emma Skinner as well as Price all have the second highest total in the region for their weight classes. To see results for every Bowie lifter, pick up a copy of the mid-week edition of the Bowie News.